So what’s the functional form? How to estimate quadratic models? When reading articles about machine learning, I often suspect that authors misunderstand the term “linear model.” Many authors suggest that linear models can only be applied if data can be described with a line. But this is way too restrictive. Linear models assume that the functional form is linear — not the relationship between your variables. I’ll show you how you can improve your linear regressions with quadratic, root, and exponential functions. The functional form is the equation you want to estimate. 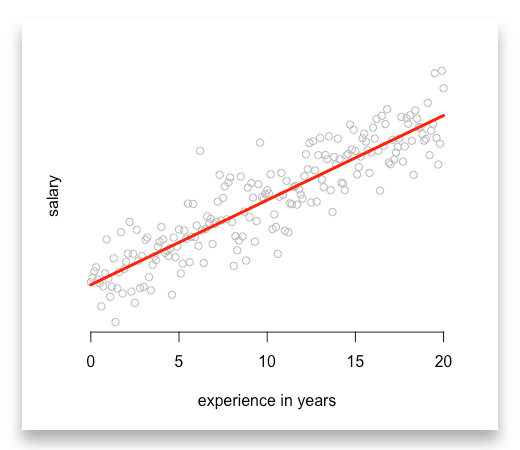 Let us start with an example and think about how we could describe salaries of data scientists. 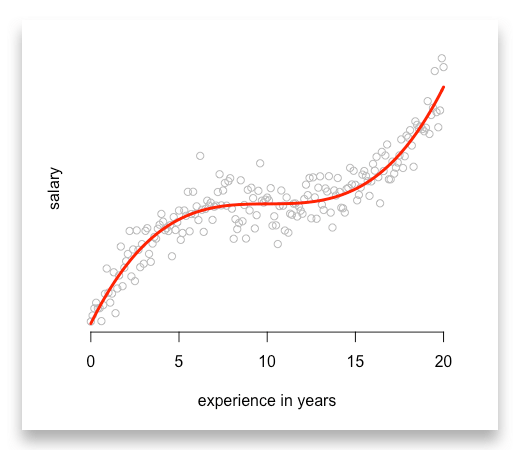 Suppose an average data scientist (i) receives an entry-level salary (entry_level_salary) plus a bonus for each year of his experience (experience_i). Now, we can interpret the coefficient beta_1 as the bonus for each year of experience. And with this coefficient we can start making predictions by just knowing the level of experience. Linearity in the functional form requires that we sum up each determinant on the right-hand side of the equation. Imagine we are right with our assumptions. 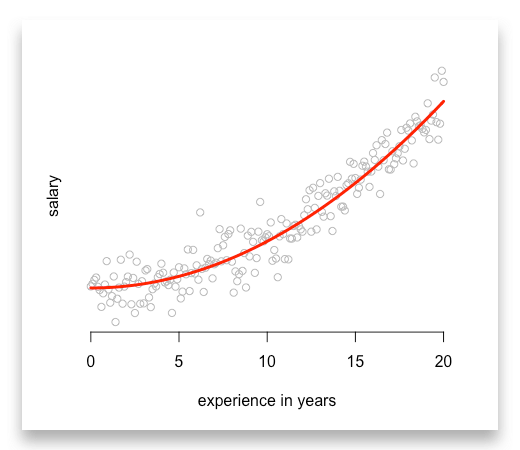 Each point indicates one data scientist with his level of experience and salary. Finally, the red line is our predictions. Most of these functions do not expect that they have to transform your input variables. As a result, they reject an error message if you try. Furthermore, you do not have a sum at the right-hand side of the equation anymore. Often we observe values that rise fast in the beginning and align to certain level afterwards. Let us modify our example and estimate a typical learning curve. In the beginning a learning curve tends to be very steep and slows down after some years. Or you might want to use the logarithmic function as it describes a similar trend. But its’ values are negative between zero and one. So make sure this is not a problem for you and your data. If you want to estimate the probability of an event, you better use Probit, Logit or Tobit models. When estimating probabilities you use distributions that linear functions cannot capture. Depending on the distribution you assume, you should choose between the Probit, Logit or Tobit model. Finally, when estimating a count variable you want to use a Poisson model. Count variables are variable that can only be integers such as 1, 2, 3, 4. For example count the number of children, the number of purchases a customer makes or the number of accidents in a region. Improve your linear models and try quadratic, root or polynomial functions. 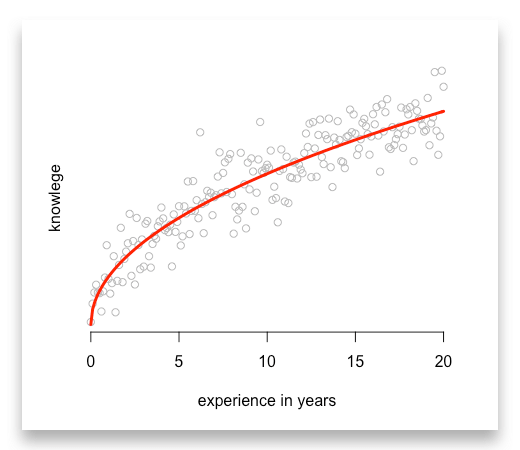 Always transform your data before you add them to your regression. I uploaded the R code for all examples on GitHub. Feel free to download them, play with them, or share them with your friends and colleagues. This article has also been published at freeCodeCamp (Medium.com).